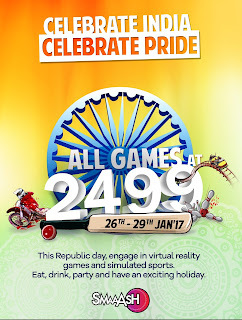 Republic Day holiday is a perfect time to unwind with friends and family. Enjoy good food, loads of virtual reality games and thrilling simulated sports – all under one roof only at SMAAASH. Make this Republic Day, 2017 and the extended weekend a reason to break free from the mundane life and savour the finer moments of life. Add entertainment and extravagance to your weekend because now SMAAASH has all its games at just Rs. 2499. Let your weekend be a sporty-Foodie indeed with no regrets. 'Founded in 2012, SMAAASH is India's much acclaimed, world class gaming and entertainment center that marries sports, virtual reality, music and dining into a highly immersive, evolved, interactive and innovative social experience for family, friends and children alike.Helmed by creative ideator Shripal Morakhia, SMAAASH pioneers the field of sports simulation technology (having created the world’s first 360 degree Cricket Simulator) and proprietary gamification technologies (such as a unique twilight bowling zone, motor racing and bike racing simulators and the city's most brilliant go-karting track).Being a virtual reality led entertainment gaming center - vastly credited to its in-house research and production capabilities, head mounted displays are used to produce games such as Walk the Plank, Finger Coaster, Cockpit 360 etc.